A Magical Rivalry Hidden Inside Your Footwear! Fits Shoe Size 6-10. Stuff Points: Earn 9 points when you buy this stuff. That single horn is eternally powerful, but it may not offer protection from the fiery breath trying to melt it. This legendary rivalry is sure to result in mythical mayhem, and you get to decide who wins. Will it be the pure white unicorn on your left foot, or the green, fire breathing dragon on your right? This fun pair of socks doesn't match, but it may be a good fit with your personality. Hide a battle inside your shoes, or dress up those pajamas with fun characters that don't get along. The high quality material feels great against your skin, and the vibrant colors combine with great details to give them personality that is sure to amuse. Sharp teeth and hot breath may win the fight, but magical immortality is hard to defeat, especially when combined with wings and a sharp horn. Sized to fit most womens feet and totally machine washable for convenience. Silly. Dragons and unicorns don't even exist. Or do they? This fun looking couple is sure to turn heads and guarantee smiles. Comfortable. High quality materials ensure a sock that will gently hug feet and feel soft and comfy with each step. All-Weather. Thick and comfy, but also breathable. Perfect to keep toes toasty in cold weather, but they also feel nice when temperatures rise. Long Lasting. What good would they be if they didn't last? Durable materials and colors that won't fade ensure a long life and good value. Have some smaller feet to cover? We also have socks for girls and boys, and booties for infants. The kids versions come in a three pack in girls or boys styles. The booties are individually packaged by style, so check out each one: dog/cat, owl/mouse and dinosaur. Love the rivalry, but looking for something a little more visible? Check out the Vs. Mittens for predator vs. prey pairs that go on your hands. Order Yours Today! Washing Machine Wash. Tumble Dry. 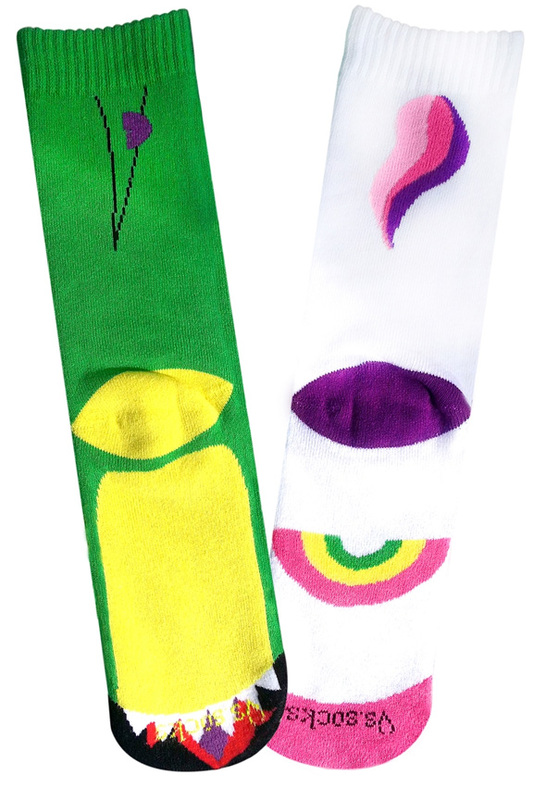 Step into mythical awesomeness when you pull on these socks. 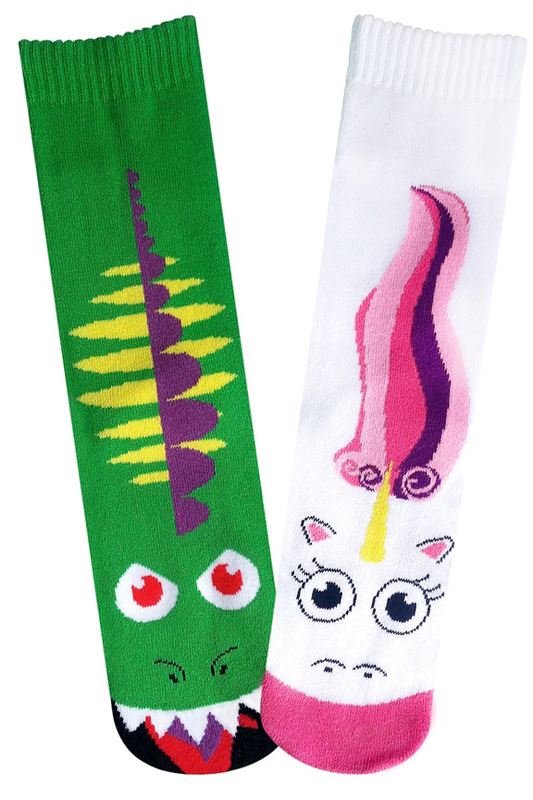 Imagine all of the fun your feet will have when one is a dragon, and the other is a unicorn. Order Yours Today! Kids 4-7 Size Predator Vs Prey Mittens. For Kids 4-8 Years Old. Get Three Different Pairs Of Opposing Character Socks. One King And One God. Two Gigantic Monsters That Don't Get Along. Size 8-11. Nighttime Isn't Safe With This Pair Around. Monster Socks That Guarantee Conflict. Size 8-11. Watch The Fur Fly When These Two Animal Rivals Pair Up. Size 6-10.